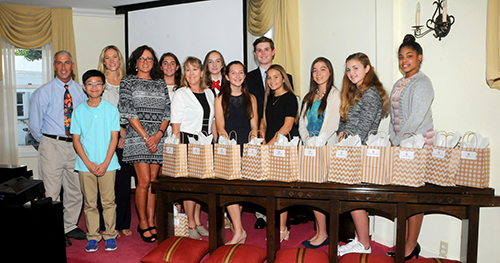 The Palm Beach Fellowship of Christians & Jews Inc. honored 12 Palm Beach County students during an awards ceremony following the organization’s annual meeting on April 24 at the Paramount Building in Palm Beach. The students were among more than 350 who submitted entries to the fellowship’s annual Essay & Creative Arts Competition. The 2017 topic was “Voting.” The two first-place essays in the middle and high school divisions were read by the authors at the event, and all the winning essays and art work were on display at the reception. The students received cash prizes for their efforts. The supervising teachers of the winning students received office supply store gift cards to use for classroom supplies. Essay contest winners were Harrison Schrams of the Oxbridge Academy, Maggie Acosta of the Rosarian Academy, Jack Vo of Western Pines Middle School, Lizzie Barnum of St. Ann Catholic School and Jacob Perez of Western Pines Middle School. The music contest winner was Peter Rothberg of Western Pines Middle School. Art contest winners were Aliyah Lumia of Western Pines Middle School, Flora Beleznay of the Pine Crest School, Anna Stengal and Mariana Beaujardin of St. Ann Catholic School and Elizabeth Tischuk of Western Pines Middle School. The photography award winner was Shelby Bakkedahl of Western Pines Middle School. The Palm Beach Fellowship of Christians & Jews is dedicated to promoting fellowship, understanding and respect among all religions and cultures; bringing the community together through education, dialogue and interaction; and addressing issues rooted in intolerance, anti-Semitism and unjust discrimination. The fellowship will be commemorating its 25th anniversary during the upcoming 2017-18 season. Visit palmbeachfellowship.net for more information. ABOVE: Steve Gordon, Jack Vo, Chrissie Ferguson, Barbara Milanese, Flora Beleznay, Mary Cooney, Mariana Beaujardin, Lizzie Barnum, Harrison Schram, Maggie Acosta, Elizabeth Tischuk, Shelby Bakkedahl and Aliyah Lumia at the awards ceremony.